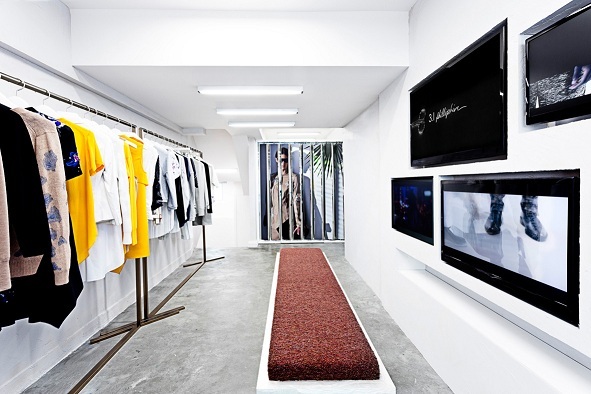 3.1 Phillip Lim opened its first ever Hong Kong Pop-up retail space for Asia, located on Wing Fung Street, Hong Kong. Designed in collaboration with Jonathon Beck, the New York-based Production and Set Designer, the space will be open for 10 months and will house four different stages of discovery showcasing its Holiday Resort collection, Mens & Women Spring and Fall 2013 Collection. With store size of 800 sq. ft., the 2-storey pop-up store is designed to further solidify the notion of discovery for the 3.1 Phillip Lim brand and to reflect inventory change. Exploring the notion of a flexible and constantly evolving interior, the pop up retail space will embrace the feeling of an art installation, with louvered walls that rotate, revealing a hint of something subversive within. Throughout the 10-month lifespan of the store, the façade and interior of the store will evolve and change, with an emphasis on the juxtaposition of textures and treatments. To bridge the unique brand experience between our Pop-up store and online world, a micro-site www.31philliplim-hk-pop-up.com was created to connect the in-store excitement to digital content, social media and marketing activities, serving as the perfect platform to entice users to explore more about the world of 3.1 Phillip Lim and share the exclusive contents and giveaway with their friends. Each month the site will feature fashion insiders and taste maker line-up to share their views and unveil their very own Phillip Lim style. The Resort 12 and Pre-Spring 13 Collection will be first launched at 3.1 Phillip Lim Pop-up store in Hong Kong.